All Saints' Church in the centre of Rotherham is to be renamed Rotherham Minster at a service on Tuesday. The move comes only weeks after St George's in Doncaster was raised to the higher status of Doncaster Minster. 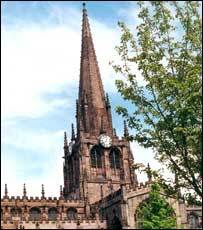 The church's 180ft spire has towered over the heart of Rotherham for more than 500 years. Its vicar, Canon Jane Sinclair, said: "This is something the people of Rotherham can be proud of and will help the future development of the borough." She added that having a minster would raise the profile of Rotherham and set All Saints' alongside Sheffield Cathedral and Doncaster Minster as one of the three key churches in the diocese. Tuesday's service will be conducted by the Bishop of Sheffield, Jack Nicholls.